Welcome to “Love it…Keep it” where I chatter on about things I’m currently lovin‘ on. If you want to do a “Love it…Keep it” post of your own, make sure you link to me and then leave a comment on this post so I can link to you! This week I’m lovin‘ on some beauty products. First up is Dove’s Deep Moisture body wash. I have been a loyal Dove user for over 14 years now! Their products are amazing and gentle. 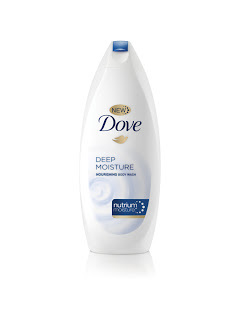 I am allergic to a lot of different body washes, but have never had any problem with a Dove product. The Deep Moisture is especially great for helping your skin stay hydrated during the winter. It makes my skin so soft! The husband loves it! (my skin, not the body wash, just to be clear). Up next is the Urban Decay’s 24/7 Glide on Eye Pencil. I use it in “Stash” which is a dark green/gold color. I never would have picked it out myself, but it looks great on. I had a make-up artist from Urban Decay do my make-up and she picked it out…and I love it. It goes on really smooth and makes your eyes sparkle. 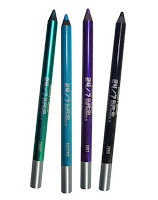 The pencil lasts a long time too (like at least 6 months), which is great if you are on a budget like me! One word of advice: make sure you buy Urban Decay’s sharpener too. Now, I’m going to talk about my hair. I get a lot of questions about how I keep my hair curly (like in the picture below of me and my childhood friend Rebecca). Well, first, genetics. My mom has awesome hair genes that she passed down to me (thanks Mom!). My hair is wavy, so I can do straight or I can do a curl. 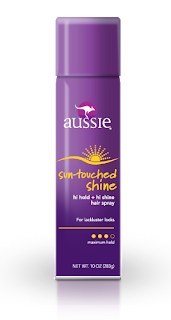 But, in order to keep my curls looking good I use Aussie’s Hi-Hold Hi-Shine Hair Spray. I love this stuff. It holds without leaving your hair too crunchy. But I’m okay with a little crunch here and there. I spray each section of my hair first, then curl it with a curling iron. Really, my whole hair process could be a post in itself. If you want more details, let me know and I’ll post it! And last is my new favorite thing. 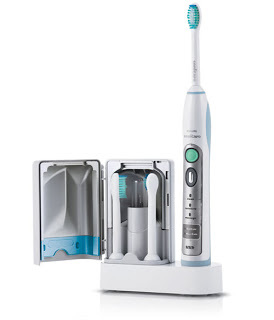 The Sonicare FlexCare toothbrush. My mom got it for me for Christmas (thanks Mom!) and I’m obsessed. It makes your teeth feel so clean! The husband totally made fun of me for using it…but guess what? He uses it now too and loves it! Thanks for stopping by “Love it…Keep it”! What are you lovin‘ on this week? I always look forward to your "love-it-keep it" post. Keep it up!